Over time, your tires wear down as you drive on them. Worn out tires can be very dangerous. When their tread wears away, tires lose traction and are unable to grip the road as securely, which increases your risk of slipping and sliding and losing control of your car while you drive. Plus, old or worn out tires have a much higher risk of going flat or blowing out, which can lead to road accidents and collisions. Unfortunately, it can be difficult to tell exactly when you need to get new tires. Many drivers stretch the lifespan of their tires way too long because they forget to replace them or they just don’t notice any problems. Just because you don’t notice any changes in your tires doesn’t mean they’re still in good enough condition to continue driving on them. Stay safe and check out this guide to learn five foolproof ways to recognize when it’s really time for you to get new tires. When you get a new set of tires, make a note of the date and how many miles you’ve logged on your car. Every year, check your mileage again and note how many more miles you’ve driven. Most drivers drive an average of 12,000 to 15,000 miles per year. If this statistic rings true for you as you keep track of your yearly mileage, go get your tires professionally checked every three to four years. The number of miles you drive isn’t the only way to measure when you should get your car’s tired checked. 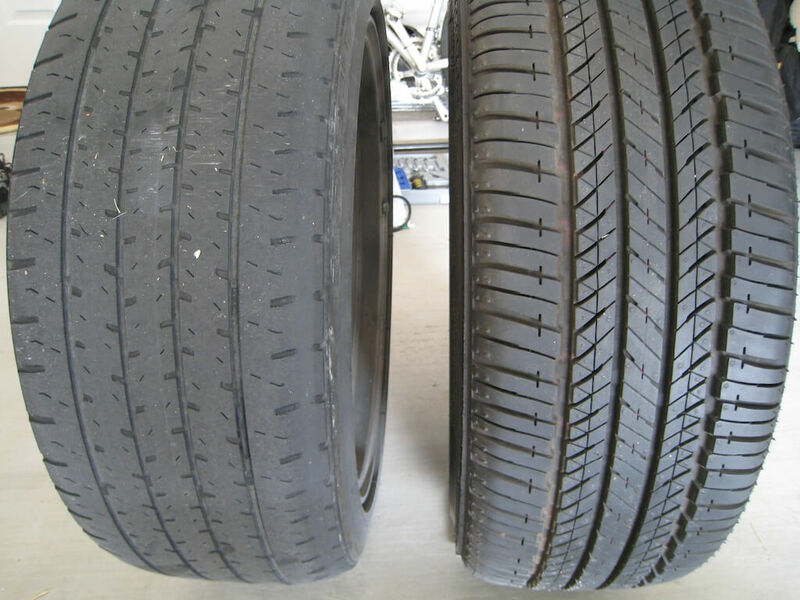 Even if you only drive a few thousand miles per year, get your tires checked every four to five years. Aging tires have a higher risk of cracking or bulging, even if you haven’t driven many miles on them. A good rule of thumb is to plan on replacing your tires every three to five years or every 35,000 to 50,000 miles--whichever comes first. If you drive in harsh weather conditions or on bumpy roads filled with potholes, loose gravel, and other obstacles, you likely need to get your tires replaced more frequently. Driving in difficult conditions regularly wears out your tires more quickly. It also puts you at a higher risk of losing control of your car once your tires are slightly worn down. If you live in an area that gets a lot of rain or snow or consistently drive over roads that are in bad condition, get your tires checked every two years to be safe. It can be hard to tell if your tires’ tread is worn down just by looking at them. Fortunately, there’s an easy way to test your tread depth--all you need is a penny. Place a standard Lincoln-head penny into the tread of your tire. Make sure Lincoln’s head is facing down. After you’ve inserted the penny into your tire’s tread, look to see how much of Lincoln’s head is still visible. If it’s completely hidden, your tread is still pretty deep. If you can still see most or all of Lincoln’s head, however, your tread has worn very thin and it’s likely time for you to get your tires replaced. While worn-down tread is one of the most common and most dangerous tire problems, tread is not the only part of your tires that can tell you if it’s time for you to get your tires replaced. As they age, tires are susceptible to developing cracks and bulges. Cracks appear as noticeable grooves in the sidewall of your tires. They signify a leak that can cause your tire to go flat or blow out without warning. Bulges and blisters happen when the outer surface of your tire gets weak. They protrude out past the rest of your tire and put your tire at a very high risk of blowing out suddenly. If you notice cracks, bulges, or blisters on the surface of any of your tires, get your car to a repair shop as soon as possible. A sudden flat or blow out on the road is not something you want to risk. Every car vibrates at least a little bit. However, excessive vibration is a warning sign of tire problems. If you notice your car is vibrating more than it usually does while you drive, that extra vibration could point to any number of issues including misaligned or unbalanced tires as well as internal tire problems. Some cars vibrate more than others. If you’ve been driving the same car for a while, you should already have a pretty clear idea of how much vibration is normal for your car. If you really want to test your car’s vibration levels, go driving on the smoothest, flattest road you can find. Sometimes, drivers misattribute their car’s high levels of vibration to bad, bumpy roads. If you still notice that your car is vibrating severely when you’re driving on a road that you know is in good condition, it’s probably time to go get your tires checked out or schedule a service.